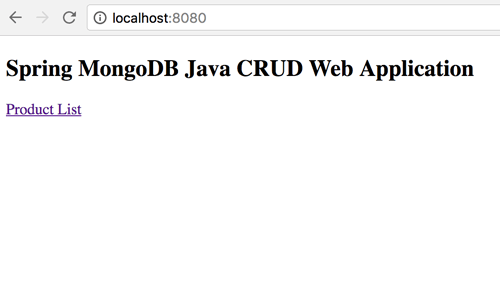 Step by step tutorial on how to create Java and MongoDB create, read, update, and delete (CRUD) web application using Spring Boot, MVC and Data. This is a practical step by step tutorial on how to create Java and MongoDB create, read, update, and delete (CRUD) web application using Spring Boot, MVC, and Data. We will show you how to create the web application that can display the list of product, show, create, edit, update and delete it. We assume that you have installed JDK 8, Gradle and IDE (Netbeans or Eclipse). Next, we will create a new Spring Boot Gradle project using Spring Initializer. 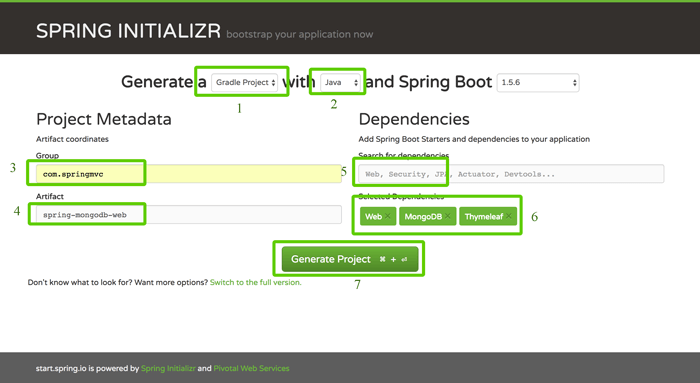 Just go to Spring Initializer web-based Spring project generator then fill the required frameworks and libraries. After filling all fields, click Generate Project. It will automatically download the zipped project. Next, extract the zipped project to your java projects folder. On the project folder root, you will find `build.gradle` file for register dependencies, initially it looks like this. Next, open terminal then goes to the newly extracted project folder then type this command. It will build and install all Gradle dependencies. 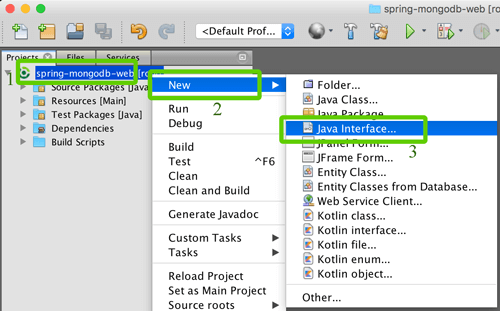 Open this Gradle project using Netbeans or Eclipse then open and edit `build.gradle` from the root of the project folder. Add this line to dependencies to install additional Twitter Bootstrap front UI/UX. On the terminal run again this command. To configure Spring Data with MongoDB, simply open and edit `src/resources/application.properties` then add this lines of strings. Part of MVC concept is Model/Entity/Domain. For that, we will create a new Model or Entity class. Using IDE like Netbeans right click on project name in projects panel then choose New then choose Java Class. 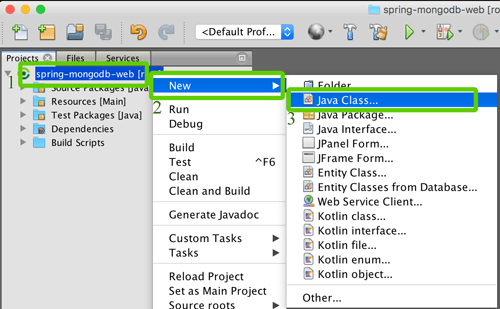 Give the class name `Product` and the package name `com.springmvc.springmongodbweb.models` then click finish button. That will create a new file name `Product.java` and open in Netbeans main panel. Fill with the codes below. That product class mapping to products collections of MongoDB which has 5 fields. Each field has getter and setter. Now, we need to create an interface for connecting Product model and controller. On Netbeans right-click project name on projects left panel then choose new then choose Java Interface. Give the name of interface `ProductRepository` and create new package name `com.springmvc.springmongodbweb.repositories` then click Finish. It will open `ProductRepository.java` interface file on the Netbeans main panel after created. Just replace all codes with this codes. Now, it's time for `C` terms of MVC that means Controller. To create it on Netbeans just right click on project name from projects left panel then choose new then choose Java Class. Give the name of controller class `ProductController` and create a new package name `com.springmvc.springmongodbweb.controllers` then click Finish. It will open `ProductController.java` file on the Netbeans main panel after created. Replace all codes with this codes. On that controller class, we put all CRUD function that interacts between view and model. Now, it's time of `V` for the View of MVC pattern. Since we are using Thymeleaf library for view template, so we can create the same layout for all HTML pages. To create the layout, first, create a `default.html` file on the `Resources/templates` folder then add or replace with this lines of codes. Next, create view for creating a product form with the name `create.html` on `Resources/templates` folder then replace all codes with this. Next, create view for show product detail with the name `show.html` on `Resources/templates` folder then replace all codes with this. Next, create view for edit product with the name `edit.html` on `Resources/templates` folder then replace all codes with this. Finally, open and edit static HTML file `Resources/static/index.html` then replace all codes with this. This `index.html` is the first page that shows up on the browser after Web Application run. Using Spring Boot, already define the main class for running the application. Just open the terminal or cmd then type this command to run the web application. Then open the browser and go to this address `http://localhost:8080` and you will get the home page like this. Just click on the `product list` link then you will get the page for do some CRUD operation. That it's for now. We are creating this tutorial especially for Java Web newbie, for the master of java we need any suggestion and critics in the comments below. You can find the full and working source code on our GitHub.